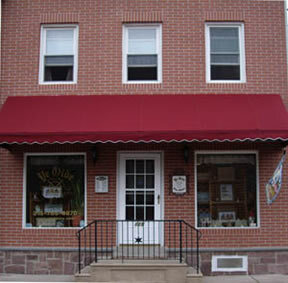 Established February 3, 1984 as a mail-order business, Ye Olde Cross Stitchery opened our first retail shop three months later in Historic Bristol Boro, Pa. We moved to our current address in the downtown business district at 119 Pond Street within three years, and after out growing our first location. Our store is small and quaint, but our selection cannot be beat. Along with providing service to our walk in customers for the past 24 years, we have been mailing purchases to cross stitchers all over the world. 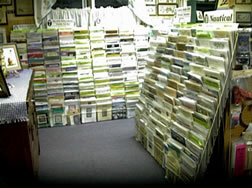 The walls of our shop are filled with models ranging from very easy to difficult and challenging. Something for everyone's taste. 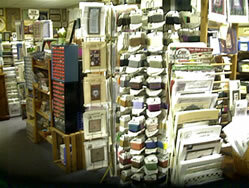 We have over 300 models on our walls at all times ranging from Amish, Samplers, Florals, to Seasonal and all Holidays. We change our models ongoing as new models are stitched. We also change our front windows for each season as well as each holiday to give everyone a taste of what is inside as they take in the view. Our knowledgeable staff stitches our wall models; therefore they can answer any questions that you may have. We do custom framing and also carry a large array of pre-made frames. overdye fabrics. We carry the complete line of overdye floss from Threadworx, Crescent Colors, Sampler Thread, Weeks Dye Works, and The Caron Collection; plus we carry Rainbow Gallery flosses, Kreinik Metallics, DMC floss, # 5, #8, #12 Perle Cotton, and Anchor floss. We even have some Thread Gather flosses, Gloriana Silks, and more. Since our customers like to pick out their own fabric, we do not have an extensive array of kits in stock, but the one's we have are the cream of the crop. We carry kits from Shepherd's Bush, The Trilogy, Heart in Hand, Lizzie Kate, Bent Creek, and Kreinik, to name a few that we stock. Lananrte, Thea Gouverneur, Permin, Riolis, and Vervaco Kits are ordered on demand as they are imported from overseas. Take a minute to familiarize yourself with our site and stop back often. We will be updating the new items area weekly and the shop model section as soon as a new model is completed. The store hours are: Tuesday, 10:30 a.m. to 5:00 p.m., Thursday, 12:30 to 6:00 p.m., Friday, 12:30 to 6:00 p.m., and Saturday, 10:30 a.m. to 3:00 p.m. (Summer Saturdays we close at 4:00 p.m.) We are closed Sunday, Monday, and Wednesday. We also have an answering machine on at all times if you wish to leave a message - we will call you back. Our telephone number is (215)785-0870, and our toll free number is (877)785-0870.